Ralph Lauren's car collection is very nearly perfect. 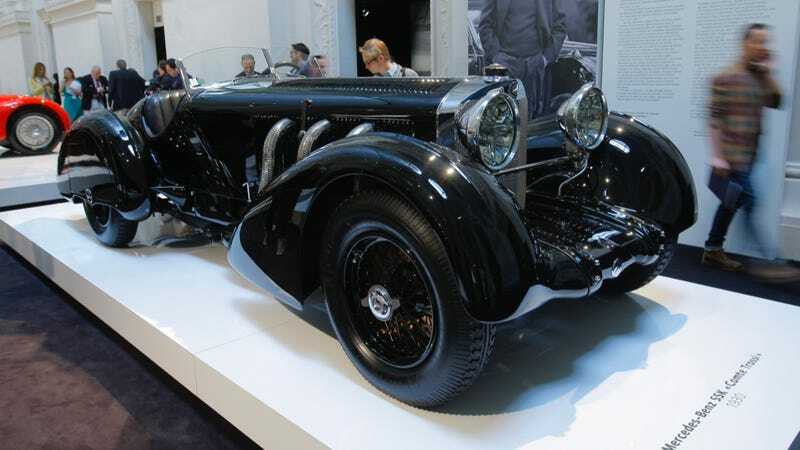 It holds gems like the 1930 Mercedes-Benz SSK "Comte Trossi" (pictured here), a 1955 Jaguar XKD, a McLaren F1 LM, and a Ruf CTR3. So when a lawsuit divulged that he only spends 30 hours a year in his garage, I was weirdly cool with that. And really, it just comes down to basic math, and a little understanding for the poor sort of chap in this world who has way too many cars. "In fact when Mr. Lauren is at the premises, his normal activities include walking through the building and looking at the automobiles stored therein, as well as discussing individual vehicles and automobiles shows and museum tours with Reinwald," his lawyers wrote in a legal filing. "Occasionally, a guest will accompany Mr. Lauren to view the automobiles." Now you might have just skipped over that enormous blockquote, frothing at the mouth over a man spending only 30 hours a year with one of the finest collections of machines known to all humanity. Of course you, my rabid friend, would spend every waking and sleeping second of your diseased life salivating over every single inch of wonder that resides within, because who wouldn't. But if we're being fair to our pal Ralph, that's actually not so bad. Most people who have any sort of garage usually just use it for storing their minivan, and they probably don't spend 30 hours a year in there. Just open the door, hop in, turn it on, drive away. Less than 30 seconds involved in that. Ralph, on the other hand, is spending two and a half hours a month in his garage. Just hanging around. Talking shop, with his full-time mechanic and curator. Not driving at all. Which is nice for a guy who still has to run a fashion empire that probably doesn't afford all the free time in the world. And we should keep in mind that the lawsuit doesn't say he only spends 30 hours a year driving the cars. Just that he spends that amount of time in the garage, which includes the 30 second stints when he knows which car he wants, hops in, and putters away in many many millions of dollars worth of Bugatti. Maybe you still consider Mr. Lauren a selfish jerk, though, for not spending more time with his cars. But really, that couldn't be further from the truth. He does share them, in museums and public events, with both car enthusiasts and non-enthusiasts alike. So in fact, if he spent any more time in his garage, just sitting there in solitude and without a care to share it with anyone, that would make it much worse. Go ahead and disagree with me in the comments, selfish rabid jerks of the world.